Announcing the release of Wilger’s brand new dual-chamber drift reduction spray tip series, the UR. 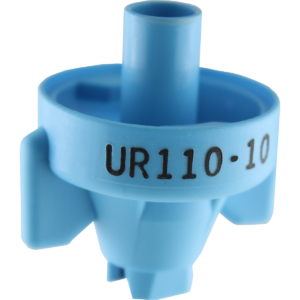 The UR series joins the COMBO-JET® tip-cap family, being a coarser alternative to the current COMBO-JET® DR series. The UR is Wilger’s fourth stage drift reduction spray tip. With the addition of the UR, Wilger now offers 5 series of spray tips that give the ultimate choice of coverage and drift reduction to maximize efficacy for any spray application. What is the COMBO-JET® UR Series Designed For? The UR series is design to be used specifically with Pulse Width Modulation (PWM), as it is currently the only 4th stage drift reduction spray tip available for all PWM systems. The UR series is still a great option for standard spray systems as well, as it provides a huge amount of drift reduction but still maintains a consistent and even spray pattern. With extremely coarse spray tips; often, an even spray pattern is sacrificed to maintain the significant levels of drift reduction. The UR series maintains better spray pattern distribution at lower operating pressures than other ultra-coarse drift reduction spray tips. The UR series is also designed to be used with new herbicide applications that are very drift sensitive, or to be used in areas that require a greater emphasis on drift management.